​ In late September, Carnival Corporation launched a series of initiatives that leverage today's technology in order to enhance the guest experience. These initiatives will be deployed across all of the cruise lines under the Carnival Corporation umbrella. In addition, Carnival is seeking to expand the cruise experience to guests' and potential guests' homes. 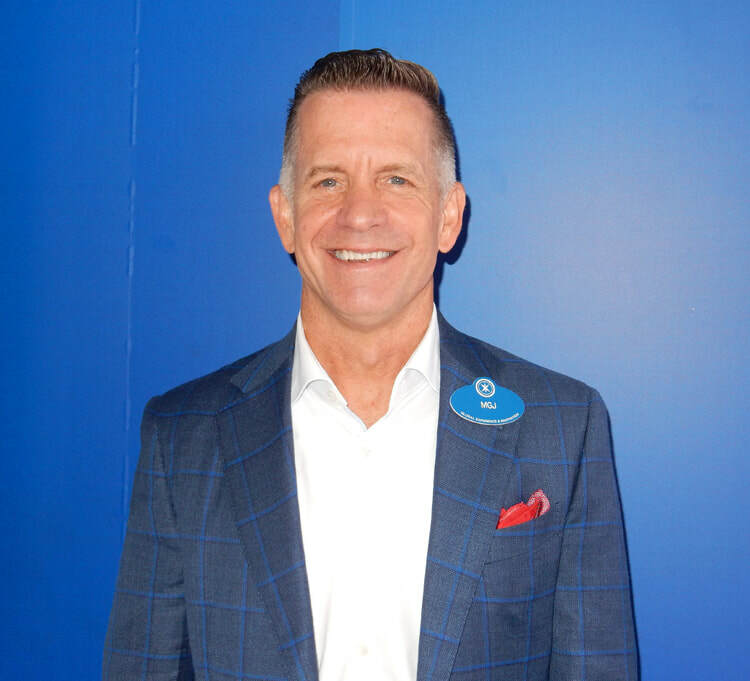 “It is all part of our relentless focus on the guest,” explained John Padgett, Chief Experience and Innovation Officer at Carnival Corporation. The first of these initiatives is called Oceanview. It is a digital streaming channel that will give access to content created by Carnival. The content includes four original series that have already been broadcast on network and cable television as well as two new series. In addition, the channel will have content created by the various Carnival cruise lines such as programs about ship construction and ship naming ceremonies. “Everything that we portray in our original content is obtainable by any guest. [It is not] travel shows with sneak peaks behind the scenes. It is what you can do. We are trying to inspire people to get off their couch and experience the world,” Mr. Padget said. Guests will be able to stream the new channel when they are onboard ship. However, they will also be able to access this programming when they are on land though Amazon Fire TV, Apple TV and Roku. “It is sad for cruise guests to disembark the cruise ship and leave all of their great experiences behind. We don't want that to happen. We have created a way - - either pre-sailing when you are anticipating the voyage and the vacation that is coming up or long after when you are enjoying the memories and looking forward to your next sailing - - to have this connection that keeps you tune with and part of your experiences that you know and love.” added Michael Jungen, SVP Guest Experience Design and Technology at Carnival Corporation. Carnival Corporation is very much involved in producing the content for the programs that will appear on the channel. “If we were just franchising it out or hiring someone to deliver something, it would not have the attention and the focus and be grounded in the experiences. John is fervent in his attention to detail on every show to make sure that the right messages are coming to life.” Mr. Jungen explained. Despite the differing demographic make-up of the passengers who sail on the various Carnival lines, the plan is to deploy Oceanview across the Carnival brands. "Never before have we done a cross brand launch to motivate and drive demand for all of our products. Whereas our individual brands are very focused on making sure that they have the right person for the right brand, our focus is on broadening the market. So our focus is on making sure that we have content that applies to everyone. Once people decide to go on a great vacation, then our individual brands take over,” commented Mr. Padgett. The second initiative is called PlayOcean. It consists of two mobile apps that give users access to a number of original games. “One of the chief tenets for inspirational content that drives experiences is when people have fun. And in today's world, a lot of that fun comes to life in those mindless pursuits that you have, either solitary engagement in games or through community social games. Games are becoming a big buzz. So we have brought together a whole suite of games that can be enjoyed by everybody, everywhere in the world all of the time.” Mr. Jungen commented. PlayOcean Everywhere features four free-to-play games that users can play either on land or at sea. The app is currently available through Apple's iTunes Store and through Google Play. 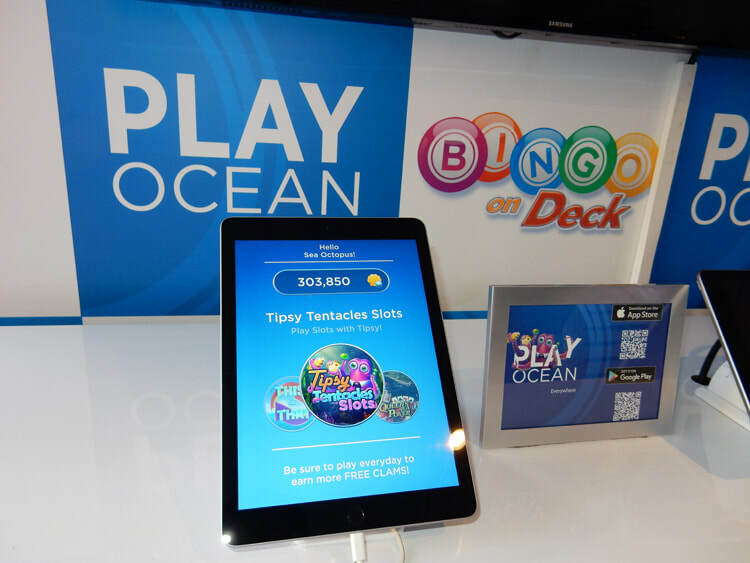 PlayOcean Casino will allow users to play casino style games for real money when they are on one of the Carnival Corporation ships. It is planned for release in November. 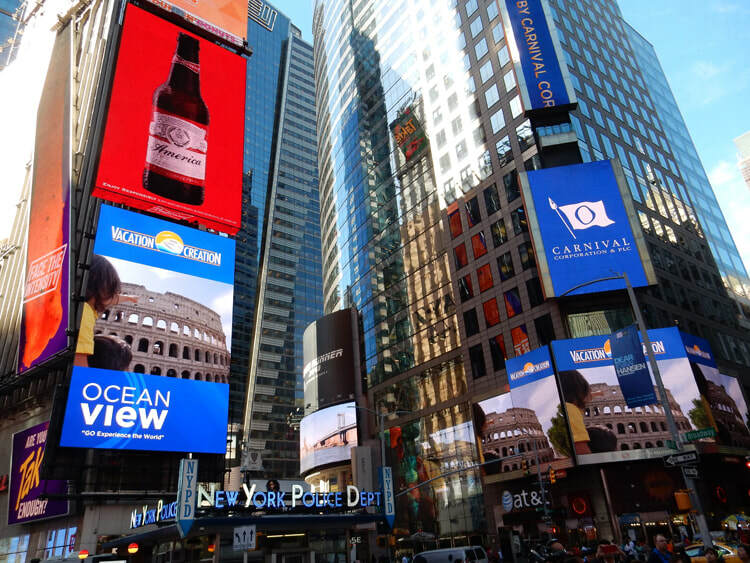 Above: To announce Oceanview and PlayOcean, Carnival took over a section of New York's Times Square. At the designated moment, Carnival advertising appeared on three of the four giant video screens at the south end of the Square. Cruise passengers have long had to accept that the internet connections on cruise ships are not like the internet connections on land. While streaming video and ubiquitous gaming is commonplace on land, it would seem beyond the existing capability of most cruise ships to provide. “We recognize that it is very important for guests to have a good connection to the things that they want to enjoy and there is nothing that distracts you more than being frustrated by connectivity. MedallionNet will be a new set of capabilities that will allow ships anywhere in the world to have the very best connection from the ship to the shore so that the content that our guests want to enjoy is always there for them” Mr. Jungen added. 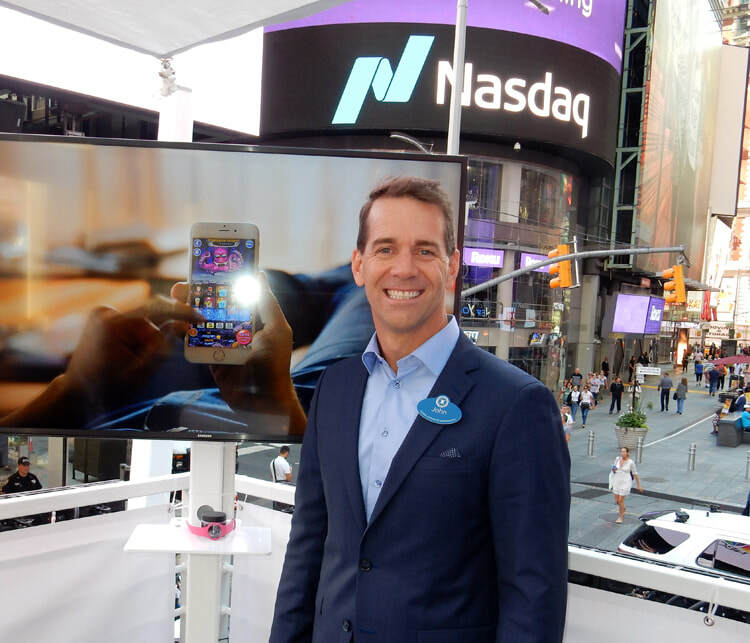 “In today's connected world, unless you know that your everyday life is calm and in order, you really can't enjoy your vacation Everyone fears I'm going to be disconnected and we don't want any part of that in our guest experience.” Mr. Padgett continued. MedallionNet service will be delivered in connection with SES Networks. The service will use multi-band antennas to access different types of satellites and land-based antennas. Thus, it is not wed to any one source for a connection. Instead, it can select the best source or combination of sources for the ship's geographic location and the weather conditions prevailing at that location. This should make for more reliable and more constant connections. Beyond the connection from the ship to shore, the MedallionNet service is configured so that there is good internet access throughout the ship. A guest will not have to open the door to his or her stateroom or carry their computer to another part of the ship in order to get a good connection. “We have made the investment with wi-fi access points in every stateroom on the ship. There is nothing more frustrating than knowing that you had a good connection when you were in the hall or in some other part of the ship and when you are enjoying your stateroom, you lose your connection. We don't want that to ever be the case.” Mr. Jungen said. MedallionNet service will debut on Regal Princess in November 2017. It is then scheduled to be implemented on a number of other Princess Cruises ships during 2018 and 2019.